When trying to send messages to these “unknown” federated partners I got “This message wasn’t sent due to company policy”. So why did I try to message a contact with a presence status of “unknown? Simply because the federated contact could see my users presence and send me IM’s, I was even able to respond to these IM’s although the presence was still “unknown”. Taking a look at the users (client side) local event log I found the same error. A SIP request made by Lync failed in an unexpected manner (status code 80ef01f8). Clearly there is some issue with either the federation SRV record or resolving the federation SRV record. Checking the SRV record from the Edge server I can see that this record is not found. Checking the DNS for the Edge server I noticed that the interfaces are pointing to the internal DNS servers. 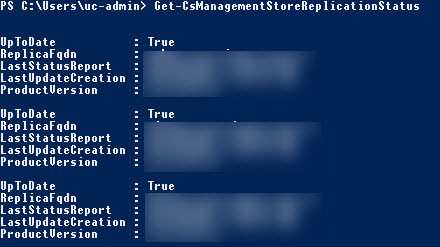 Add the SRV record for _sipfederationtls._tcp.domain.com to the internal DNS, making sure that the target FQDN is the Public Access FQDN of the Edge Server. Here is a little reason why you may want to avoid using the common sip.domain.com DNS name for your Edge Servers Access FQDN (only..). Internally the sip.domain.com record was generally configured to resolve to the front end pools, if we now need an internal SRV record for _sipfederationtls._tcp.domain.com then targeting this to sip.domain.com will simply get to the Front End Pool and not to the Federation point at the Access Edge FQDN. I don’t know about you but I certainly miss a lot of calls during any given day. Mostly because I don’t take calls when already in conversation (consider it a bit disruptive) and especially not when I am in meetings. OK so I get lots of voicemail..
Voicemail is one of those necessary evils, something I love to hate. When getting voicemail via my Skype for Business client to the Unified Messaging platform, I do love.. When getting voicemail on my cell phone, I hate how..
if I have multiple messages, I have to listen to each message in sequence. Sure I can skip a message BUT I still need to listen to the first bit to determine if its what I am looking for. In a perfect world, I’d like to get my voicemail delivered to my UM mailbox every time, regardless of the source being SkypefB\Lync or Mobile\Cell network. Changing the default voicemail service offered by your carrier may appear to be next to impossible. There are multiple reasons a call may land in voicemail. You may need to cater for each of these. The table below indicates the forward type and the codes required to manage them. The code 11 is used to indicate voice calls, additional codes exisit for data, text etc. So lets assume that my Cell\Mobile Number is +6421 123 456 and my Skype\Lync DDI\DID is +649 97 012 345 as we go through the setup. Using the phone dialler, call *61*+64997012345*11*20# using the phone’s keypad. Repeat for Forward Busy and Unreachable. Using the phone dialler, call *#61*11# using your phone’s keypad. So now we have unanswered, busy and unreachable calls to mobile\cell going to the Lync\SkypefB Client. 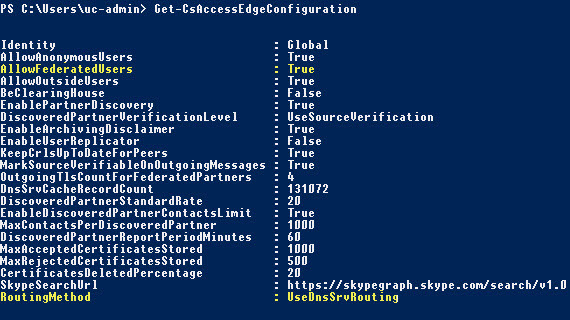 At this point the calls will follow the rules as per any call to your Lync\SkypefB client. 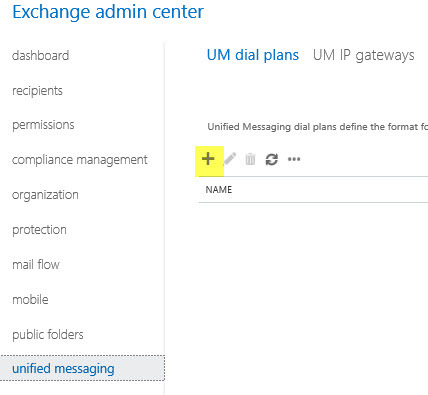 Of course we can now configure some personal options specifically for calls from mobile to Exchange UM. Configuring Voicemail for Calls from Mobile is done in OWA. From the Options Menu item select Phone and add a new Voicemail Call Answering Rule, I have called mine Mobile Voicemail. Defining the Call Answering Rule we will first specify that the call is from my Cell\Mobile number. Check the box “Calling from these phone numbers” and specify your mobile\cell number. Ensure that the Call answering Rule is enabled by clicking the On Box and click save one more time. 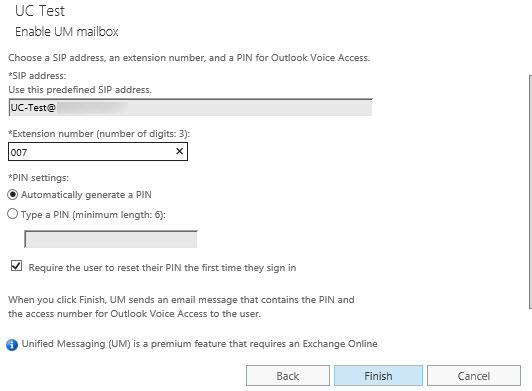 Configuring Skype for Business and Office 365 Unified Messaging for Voicemail is a fairly simple task. Of course no task should be undocumented, so here goes. 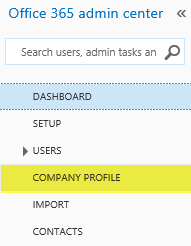 NOTE Partner discovery may be either enabled or disabled. 4. To assign the Subscriber access number, edit the UM Dial Plan you just created. TIP: I often come across a request to change Subscriber Access number, use Set-ExUmContact to change it if you need too. 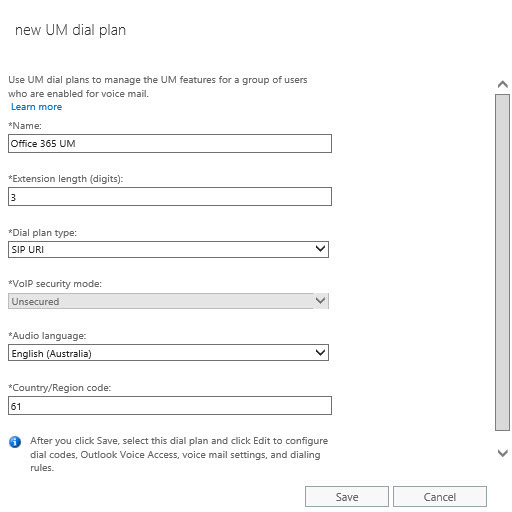 The following step only applies if UM is already deployed on premise and this UM deployment is part of migrating UM to O365. This is done from the on premise exchange environment. 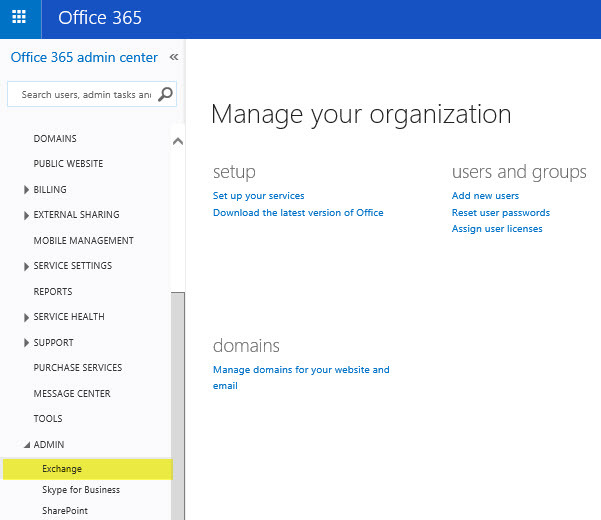 You cannot have a spilt setup where UM is in O365 and the user mailbox is on premise or vice versa. Provide the required extension number and PIN settings, click Finish to complete. Of course synchronization by way of DirSync is required to ensure that the account is enabled for unified messaging.